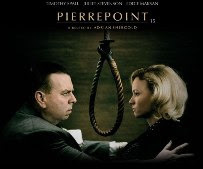 Pierrepoint: The Last Hangman is an award winning film which chronicles the fascinating macabre life of Albert Pierrepoint, Britian's best-know public executioner and last official hangman. The awkward, simple-mannered, working-class Pierrepoint takes on the same job that his mother claims drove his father to alcoholism and an early grave. He quickly rises through the ranks but becomes increasingly unsure of his moral imperatives.